Made some curry using Threadfin fish or it's best known as Senangin in Malay. 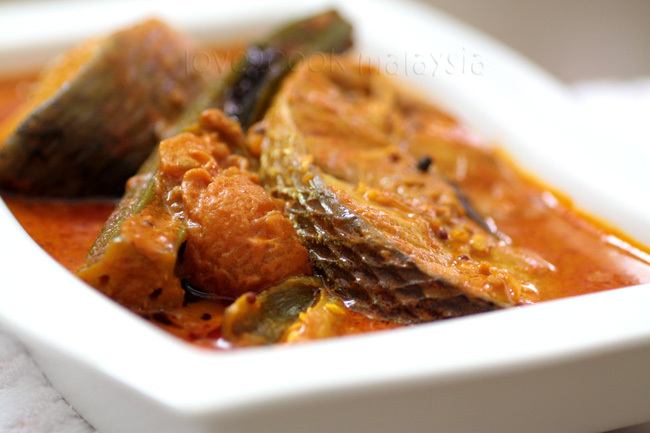 Simply tasty and meaty fish, whether you make it curry, fry or asam pedas! Heat oil in wok. Saute mixed spice seeds. Add onion, green chillis, lemongrass and curry leaves. Stir until fragrant, add garlic and ginger. Stir for 1 minute. Add water, tamarind paste, fish curry powder, chilli powder, turmeric powder and salt. Mix well and let it boil for 5 minutes. Add coconut milk and lady fingers. Let it boil again for 5 minutes. Add tomatoes. Now, add the fish blocks. Cover the wok and cook under medium heat for another 8 minutes or until fish is cooked. Stir gently once awhile. *** Adjust the amount of water used according to your preference. I'd always prefer thick curries. I too fried some threadfin to go along with the curry and rice. Spicy and delicious fish curry. Love, tq for the award...will update later dear! Yum! Yum! Two plates of rice please, I'll just eat it the traditional way, with my hands! Looks so delicious! I'm not a good fish eater too, the bones scare me a little. ohh my..slurpp..slurrppp... i suka fish curry..
Omg, slurp mouthwatering here...irresistible fish curry..
nampak sungguh sedap:)besok panaskan kuahnya lagiii sedap kan.
Mouth-watering fish curry and awesome photography..Love the combo..never cooked fish with okra..really interesting recipe!Thanks! Wah Senangin....saw lots of it at the wet market last week. Must be senangin season! 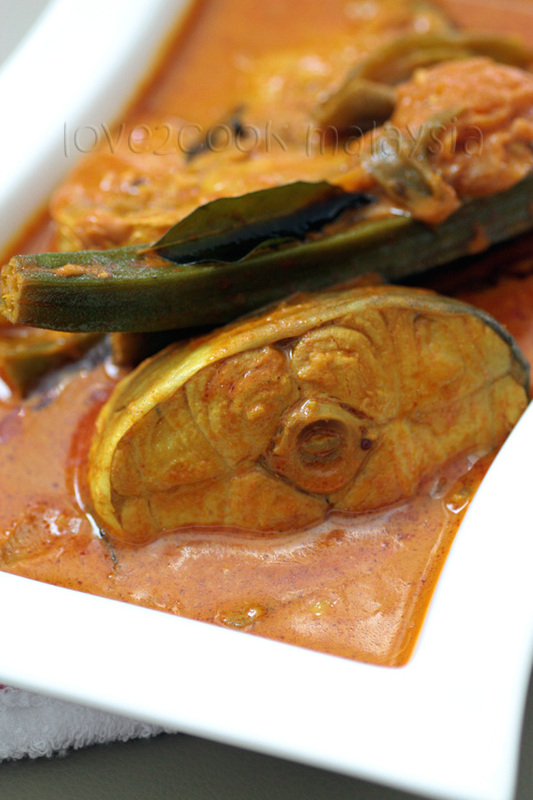 I have never seen a beautiful looking fish curry before..awesome.. I have collected your awards..tq so much sis!! Oooo, photos of the dish is magazine worthy and able to convey how delicious this curry must be. 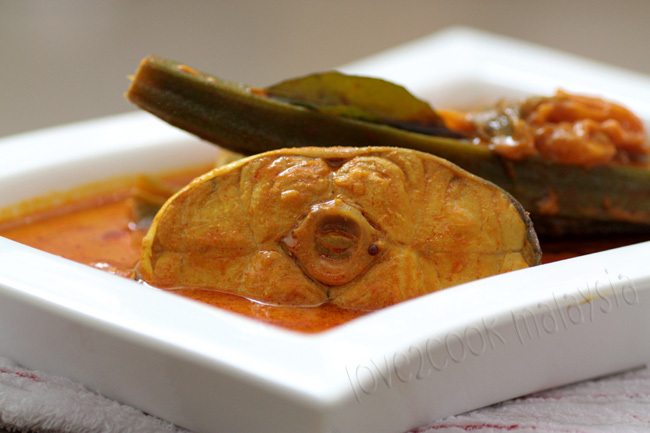 I love fish curry with lots of lady's fingers, I am drooling here. oh love.. kzura mmg sgt suka makan kari ikan.. now kzura fall in love dgn curry powder brand baba's.. mmg power rasa kari dia.. ada lg ke ikan ni love?.. 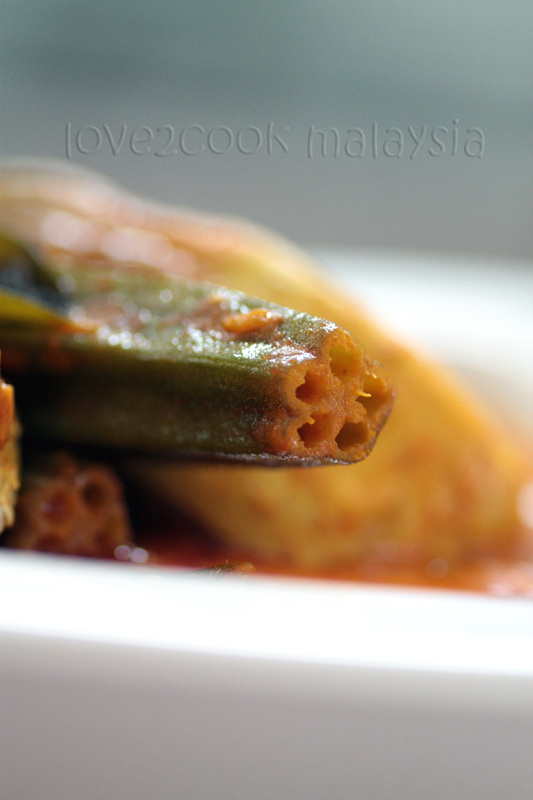 nak sekeping.. kalu ada kuah lebih boleh panaskan lg then besok cicah dgn lempeng.. waaahh yummy.. ekeke..
yummy fish curry.. so inviting..
new to ur space n love it.. happy to follow u..
YUM..definitely needs to be tried!